So… I love meatballs simmered in an Italian marinara. I could make a meal of just the meatballs forgetting the high-carb spaghetti. This led me to ponder making meatballs in some way without the work of making a marinara. Sure, I can buy a jar of marinara, but I dislike store-bought tomato sauces. All this led me to experiment with meatballs simmered in a simple beef broth. 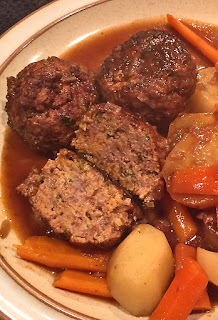 Basically these are mini meatloafs that get melt-in-your-mouth tender after absorbing the broth. I must say I was pleased with the outcome. (This recipe could easily be turned into a Swedish meatballs-like recipe by uncovering the pot near the end and reducing the liquid by half and adding a few heaping tablespoon of sour cream.) The next time I make this I’m going to add 8 ounces of sliced mushrooms that have been browned in butter in a skillet to the simmering liquid. This recipe made a dozen large meatballs. I made them larger than you normally see a meatball in a spaghetti sauce. Cooking Time - 60 minutes to 2 hours - simmer as long as you like. Tools: large mixing bowl, large covered pot, cookie sheet. Preheat your oven to 400 degrees F. Place some parchment paper on a rimmed baking sheet. This is not required but aids cleanup and keeps the meatballs from sticking to the pan. Mix all of the meatballs ingredients in a large bowl. Form into 12 meatballs. Place on the baking sheet and bake for 40 minutes, turning once half-way through. Turning prevents burning and promotes even browning. When the meatballs are done, remove them to some paper towel to drain. In a large pot sauté the mushrooms in some butter until browned, then add all of the simmering liquid ingredients to the pot. Add the meatballs, bring the liquid to a boil, reduce to a simmer and cover. Flip meatballs occasionally. Simmer for at least 1 hour or up to 2 hours. If you want to add some veggies, peel some potatoes and cut them in chunks along with some carrots. Add them to the simmering pot in the last 20 minutes of cooking. When the potatoes are tender you are done. NOTE: Onion soup mixes are very salty. If you prefer not to use them, just replace with a can of broth. In my experiment I did not add salt to the meatball mixture knowing they would be simmering in a salty liquid. And by adding potatoes at the end the salt in the liquid was absorbed by the potatoes. Potatoes are often used to remove saltiness.